Ariel is such a ponce. | details in the fabric..
I’m reading Shakespeare’s The Tempest at the moment. Just a bit of light reading. Anyway. The airy-fairy-spritey-nymph known as Ariel is a bit of a ponce. As if bigging himself up in the third person wasn’t enough, he even ‘does his sprinting gently’. I mean come on matey. Man up just a tiny bit. I realise you’re a fairy, but anyone who creates a verb out of ‘sprite’, and attaches a level of severity to it, needs to stop. I jest of course. Really. I am a big fan of good old Shakespeare, and I liest not. (Thou list!) And Ariel’s okay really. Even if he does have the same name as the little mermaid and has wings and flounces about with cowslip bells and sucking bees. 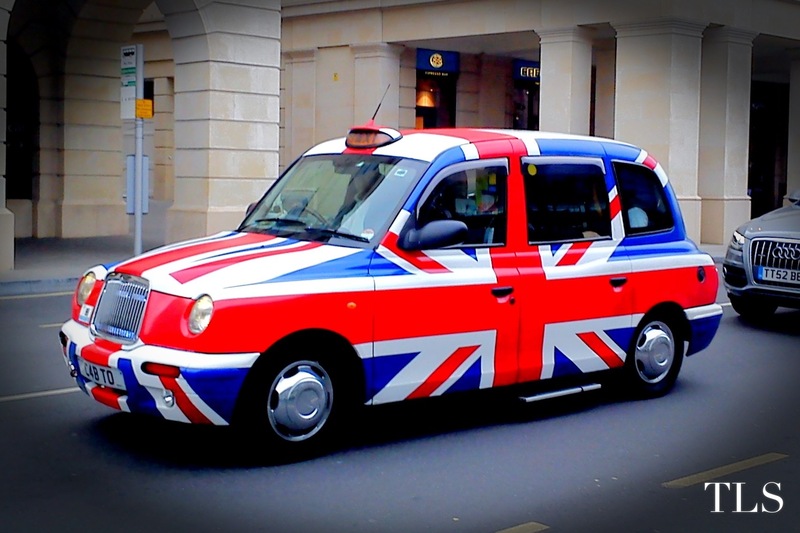 In other news; a photo of a rather patriotic taxi. Saw it recently, snapped a shot, and here it is. Previous Kitty Mischief. Next More Kitty Mischief. Saw a fantastic version of The Tempest a year or two ago at the Richmond Theatre. A joint production between the RSC and a South African company, the Baxter Theatre. The mystical elements of the play – of which there are many – had a real African flavour. The music was intoxicating. Anthony Sher was the main man, Prospero – a real master class in acting. Shakespeare lives! John, you’ll never believe it but I went to see that exact same production in 2009! It as amazing, we all loved it. The bright colours and African drums put such a different spin on the play. I had completely forgotten about it, thanks for reminding me! TBH Ariel bugs the heck out of me. He gives in way to easily to Prospero’s refusal to set him free immediately. I think my favorite character in the play is Caliban. That guy knows how to cuss someone out. He reminds me of an old neighbor I used to have. I also feel sorry for him. Prospero abuses him terribly and he knows there’s not a thing he can do about it. I want to see him catch Prospero off guard. Oh, I completely agree with you. Caliban is certainly a bit of a fool, but you have to remember that he speaks the way he does because he does not share our language. You do have to have some sympathy for him – he has no family, and his dead mother, Sycorax, was not a nice lady. I don’t really blame him for his actions either – as you said he has been so ill-treated by Prospero.